Thank you all for supporting the OH ILNAM Korea Indonesia Friendship Competition 2019! Click here to look at our students in action on the competition day album. It’s the beginning of the year again. Please click on the link below for the registration forms for your branch. For more information kindly refer to your friendly branch admin. Please take note. 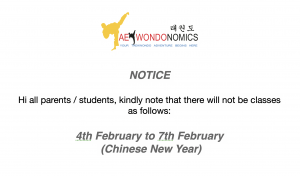 We will be open on 8th February again! 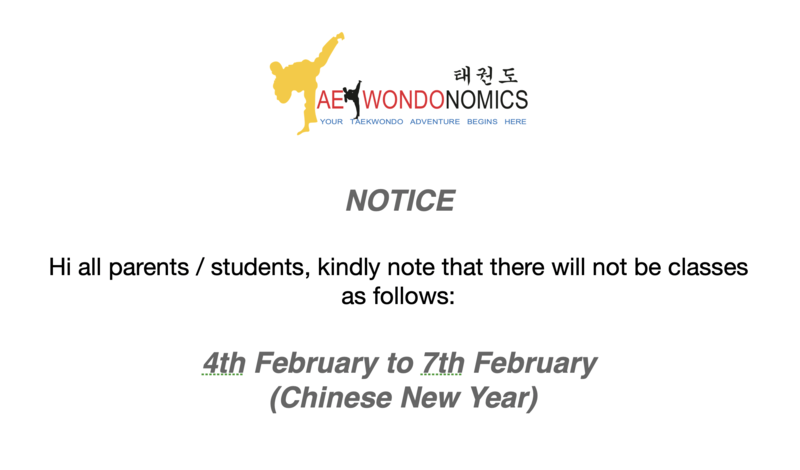 http://taekwondonomics.sg/wp-content/uploads/2016/11/cropped-nomicsoriginal-1-e1478509404135.png 0 0 admin http://taekwondonomics.sg/wp-content/uploads/2016/11/cropped-nomicsoriginal-1-e1478509404135.png admin2019-01-14 18:38:342019-01-14 18:38:34Chinese New Year Notice! This is an album for our latest Sparring Level 1. Here is the form for the up and coming UC 1 course this January 2019. For more information please contact your admins/coaches.